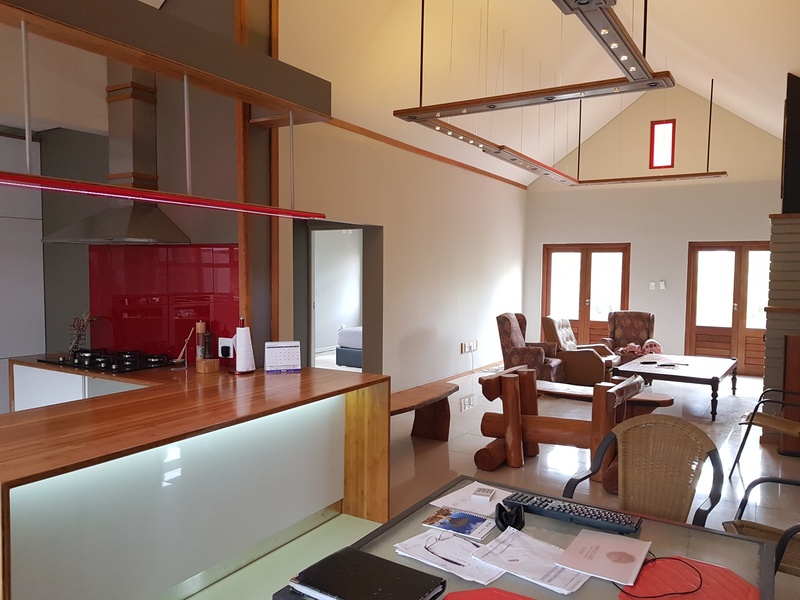 This innovative Greyton house for sale is situated in a quiet country lane in the upper part of the village, on 1034 m2 with low-maintenance garden, fruit trees and a lei-water pond. 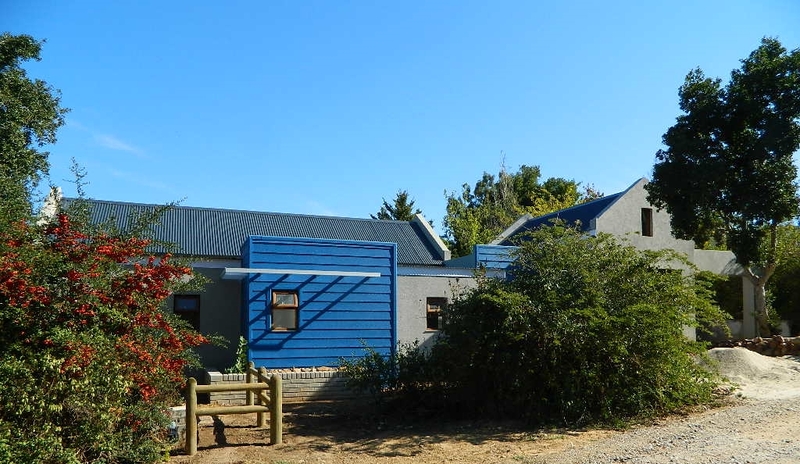 Within easy walk of the Greyton Nature Reserve, the Vlei St commonage, and the village shops and restaurants, this stylish home could be a spacious and very comfortable permanent home or the perfect holiday house; well-situated, low maintenance, and perfect for Airbnb-ing when you’re not using it yourself. 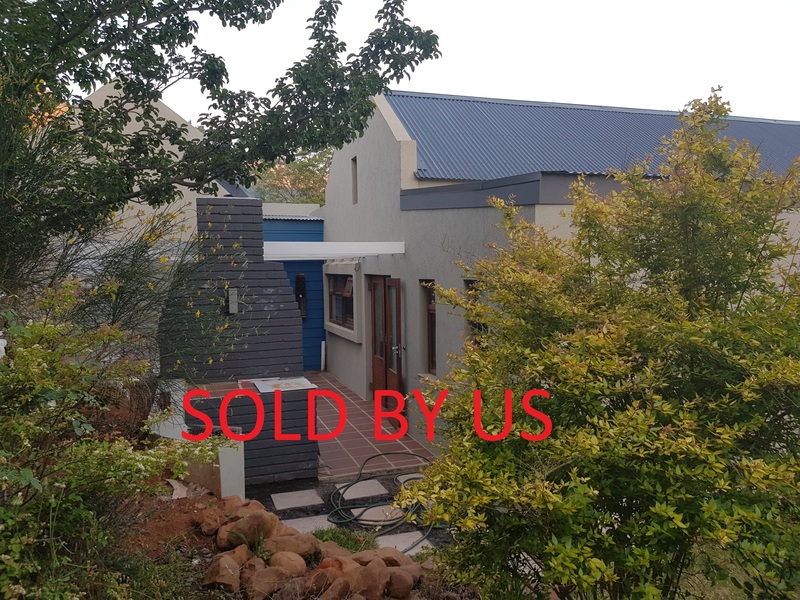 This low-maintenance Greyton house for sale of approx. 175 m2 is constructed from light steel frame, double insulated Saint Gobain system: magnesium oxide cladding on steel, EPS (further polystyrene insulation) coated with fibre cement & marmoran – a permanent plastered-on coating so you never have to paint again! Raft foundation (floors & foundation cast as one) also insulated with polystyrene. In other words, solid and well-insulated from heat and cold. Roofing is corrugated iron roofsheets over steel rafters. Garage is brick & mortar with steel rafters. The kitchen features red glass back-splashes, push-to-open kitchen cupboard doors, built-in Whirlpool fridge & freezer, ceramic gas hob, Whirlpool 6th sense oven, and micro/convection oven with infrared warming drawer, with a well-designed separate scullery/laundry and walk-in pantry with direct access to the garage. Counter tops & skirting boards are bamboo, as are the sliding wardrobe doors in the 3 spacious bedrooms. A Zen-inspired guest bathroom has picture windows onto it’s own screened & highlighted garden area. 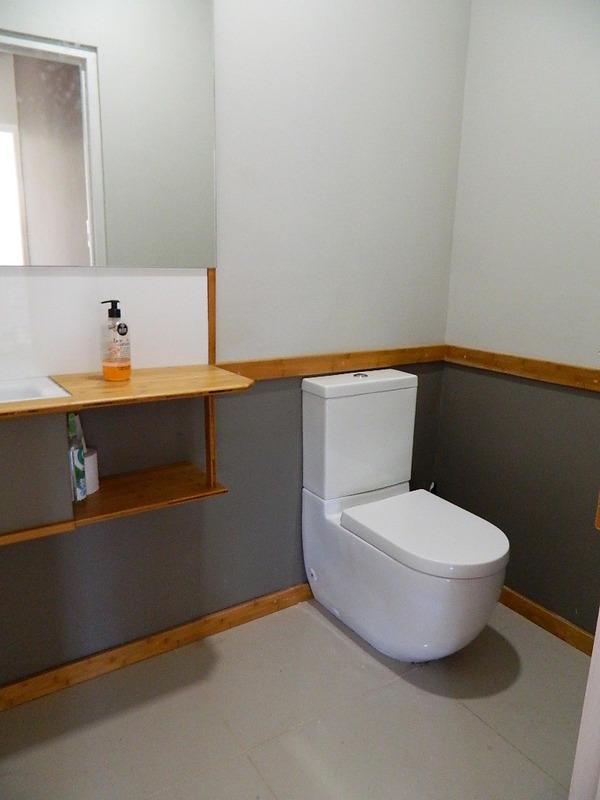 The main en-suite is a full bathroom, with corner bath and shower below a skylight featuring treetop views, and there’s a discreet 3rd WC off the living area for guests. Custom designed high-tech LED lighting throughout. 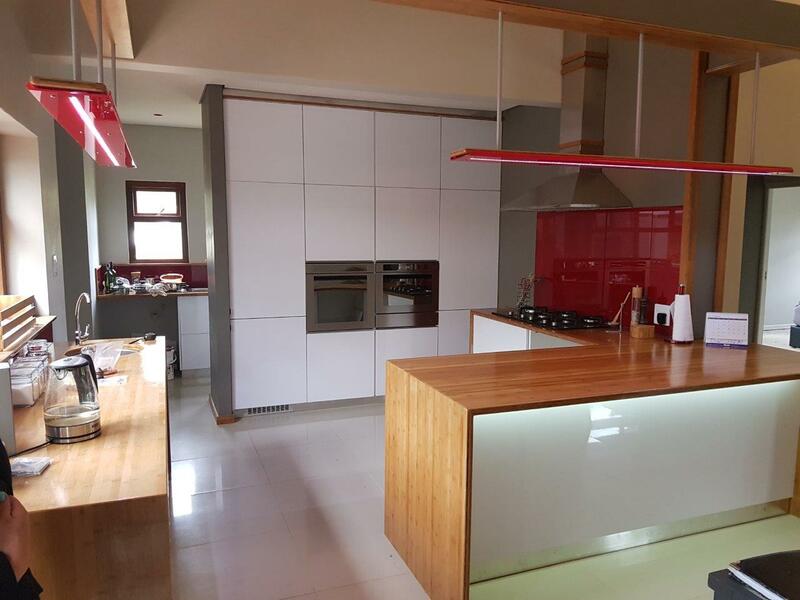 Large porcelain tiles throughout kitchen, scullery and living area. Fireplace. Carpeted bedrooms. 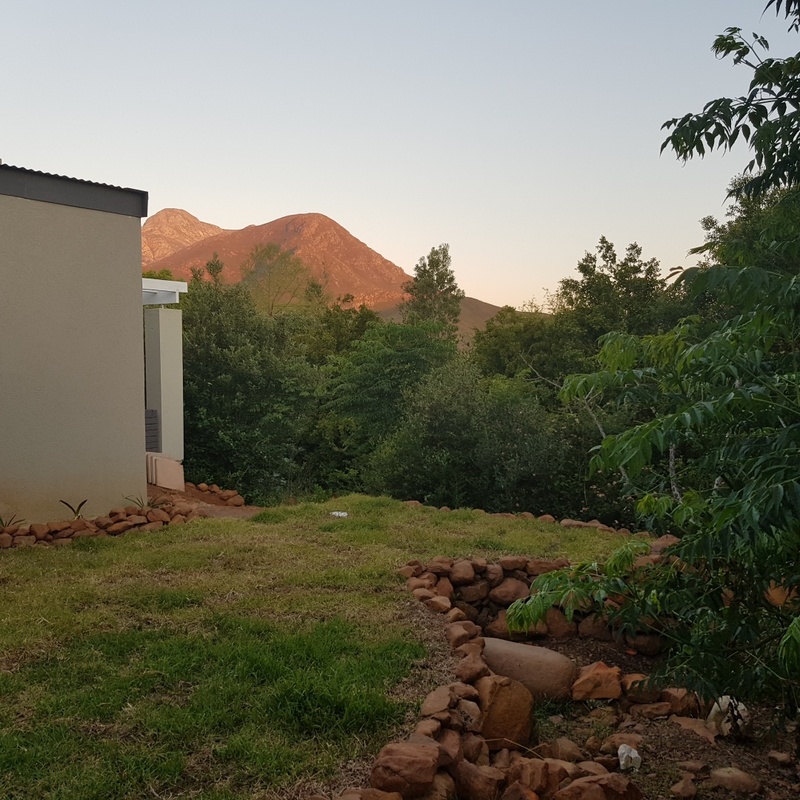 An entertainment veranda off the kitchen features a built-in-braai, and the veranda off the living room presents views of Abdul’s Kop on the Riviersonderend mountains to the East in all it’s changing colours. For those who haven’t yet discovered Greyton, our village is the gem of the Overberg, a historical village founded by Sir Herbert Vigne in 1854, nestled in a valley formed by the majestic Riviersonderend mountain range, a village lost in time where horses and cows freely roam the pretty, oak-lined lanes and everyone greets you. We have cosy coffee shops, gourmet restaurants, art galleries, quirky shops, 3 well-stocked mini supermarkets, a tennis court, an organic produce Wed market, a fabulous Saturday farmer’s market, and lots of weekend events & festivals. The Greyton commonage and 2,222 ha Greyton Nature Reserve, with 3 rivers flowing through it, offers hidden kloofs to explore, rock pools and waterfalls. Greyton is home to an interesting, caring, cosmopolitan community, and is located 30kms off the N2 just before Caledon, just 141 kms (about 1.5 hours drive) from central Cape Town.